Advanced Encryption Standard (AES), a Federal Information Processing Standard (FIPS), is an approved cryptographic algorithm that can be used to protect electronic data. The AES algorithm is a block cipher that can encrypt and decrypt digital information. 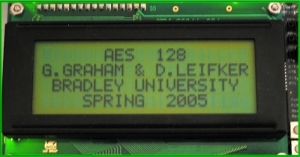 The AES algorithm is capable of using cryptographic keys of 128, 192, and 256 bits, this project implements the 128 bit standard on a Field-Programmable Gate Array (FPGA) using the VHDL, a hardware description language. In June 2003, the National Security Agency (NSA) announced that AES-128 may be used for classified information at the SECRET level and AES-192/256 for TOP SECRET level documents. AES is an algorithm for performing encryption (and the reverse, decryption) which is a series of well-defined steps that can be followed as a procedure. The original information is known as plaintext, and the encrypted form as cipher text. The cipher text message contains all the information of the plaintext message, but is not in a format readable by a human or computer without the proper mechanism to decrypt it; it should resemble random gibberish to those not intended to read it. The encrypting procedure is varied depending on the key which changes the detailed operation of the algorithm. Without the key, the cipher cannot be used to encrypt or decrypt. In the past, cryptography helped ensure secrecy in important communications, such as those of government covert operations, military leaders, and diplomats. Cryptography has come to be in widespread use by many civilians who do not have extraordinary needs for secrecy, although typically it is transparently built into the infrastructure for computing and telecommunications (Wikipedia).